Unique water soluble sulphur containing compounds are produced as garlic ages, which have a powerful effect on the cardiovascular and immune systems. Other constituents with antioxidant properties and prebiotic activity are also found in garlic. Kyolic 600mg is a food supplement that is often suggested as a source of support for cardiovascular health and a healthy immune system. Not only this, but Kyolic is naturally odourless - no longer put up with garlic-scented hands for days on end! 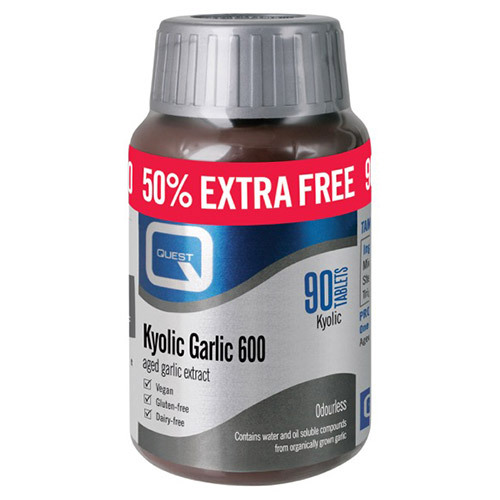 Below are reviews of Kyolic Garlic - 50% Extra FREE - 60+30 x 600mg Tablets by bodykind customers. If you have tried this product we'd love to hear what you think so please leave a review. 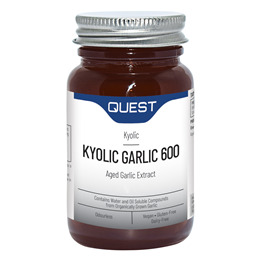 Quest Kyolic 600mg is a food supplement suggested for support of the cardiovascular system and immune system. Unique water soluble sulphur containing compounds are produced as garlic ages. Kyolic is naturally odourless.